Like most toddlers, my kids love to draw. My five year old goes through sketch books fairly quickly. She was asking for a custom sketchbook, so this is what I whipped up! 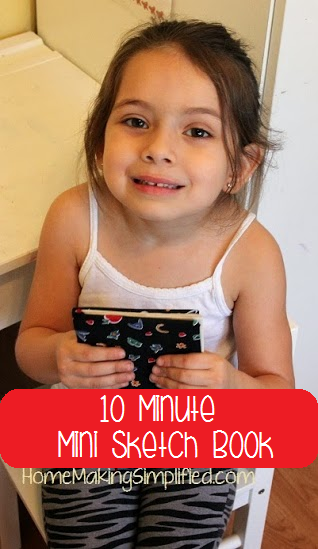 This mini sketch book used supplies most of us already have sitting at home and took less than 10 minutes. It also cost me less than a dollar in consumable products! Major plus! Next time I will make several and save them for gifts. Start by warming your glue gun. Get your paper. You will want to use about 5-6 sheets as it will be doubled. I used 8.5" x11" sketch paper from a pad I got at the dollar store, any size you want is fine. Cut your paper in half horizontally and then stack it all together into one neat pile. Fold it in half down the middle and then stitch it to bind it. Here I used my machine. Cut a piece of ribbon double the length of the paper and glue it along the binding on the back side of the book. This will be the book's bookmark. I also glued down my loose thread ends onto the back. Next, you will cut your cardboard pieces One piece for the front and one piece for the back. I used the cover of our sketch pad and cut it into quarters. They should be just a tad larger than your book--about 1/4 inch should do. Next, cut your fabric so that you can lay down your two cardboard pieces onto it. Leave a 1/2 inch gap between the cardboard pieces accounting for the spine of the paper. My gap was too small... make yours larger than this. This will allow your book to close nicely. Glue the fabric around the cardboard by gluing the top and bottom first and then folding in the sides neatly as shown. Now, glue the spine of the paper and lay it into the cover you just made. Then glue down the first and last page of the book to attach it. Make sure your ribbon is out and not getting glued down! That's it! Enjoy the smiles you get from your little ones as they doodle away!